As Tour players fight it out for popularity on social media, it’s hard to believe that a weekend warrior is putting them all to shame. Instagram is all the rage on Tour with Dustin Johnson amassing 800,000+ followers, though his wife might be the reason for his boom in online fans, but when the Putting Pirate has managed to secure a following close to a million in just over three years, we needed to know why he’s become nearly twice as popular as World No.1 Justin Rose. WWG: OK, so where did the idea come from to get into Instagram and why the name Putting Pirate? @Putting Pirate: “Most people were on Instagram before me, and at the time it came out photography was a massive hobby of mine (kind of like golf is now). But I didn’t really like Instagram back then as the quality of the photos was poor. You can’t upload high resolution images, and most of the pictures seemed to be food related, so I had very little interest. Then, back in 2014, along with a group of people we went for dinner to a super-fancy and celeb-packed restaurant and we couldn’t get a table. We tried slipping £50 note to the Head Waiter but he was quick to ask how many Instagram followers we had. We had none, so we didn’t get in and we were not happy about it. Now, myself and my friends are very technical. We’ve ‘coded’ for most of our lives, among other things, so we looked up how to quickly we could grow Instagram followers, as bribing the Maitre D’ didn’t do the trick. Those were the days when a lot of people were growing their followers by using third party software to do ‘follow-for-follow’ and ‘like-for-like’ to reach audiences and found we could use it to our advantage. Instagram has changed a lot since then. Their algorithms have become more and more sophisticated, so we stopped looking for a technical edge –and the account has been just growing organically through exposure to the game. And the name Putting Pirate? Putting was always the strongest part of my game to the point where people got annoyed with me for robbing them on the green. Someone came up with my ‘nickname’ and it seemed to stick! 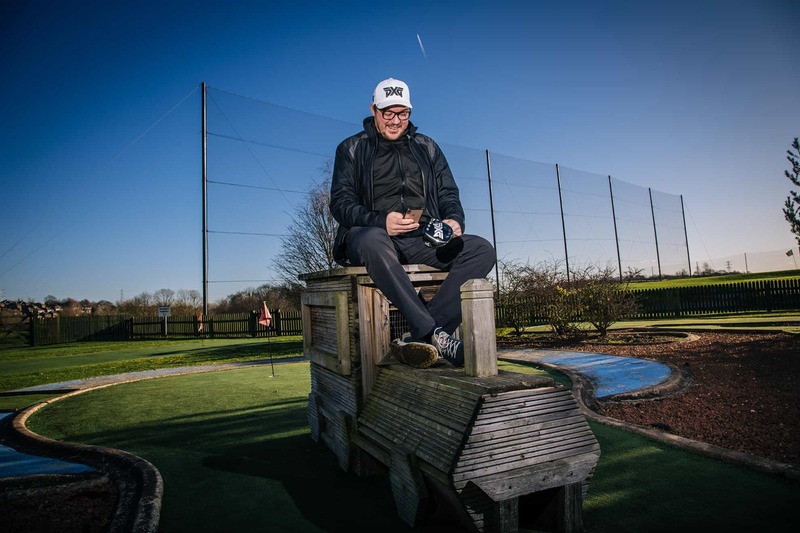 All aboard: The Putting Pirate enjoys a light-hearted photo at Pete Cowen’s Academy in sunny Rotherham! WWG: What are you like as a golfer and when did you first get into the game? @Putting Pirate: “I started playing three years ago (January 2016) and got addicted straight away. However I was bad, really bad. I thought hitting a ball with a big spoon at the end of a stick can’t be that hard – right? I took a lesson at Knightsbridge Golf School in London and the guys there were superb. I got hooked immediately. My character is such that I won’t let a game defeat me, so I wanted to get better and better. Three years on I still get bested by the game more often than I care to admit! One of my regular playing partners recently re-watched Caddyshack and now keeps comparing me to Al Czervik (Rodney Dangerfield’s character) – which I guess is a caricatured version of me on the course. I’m the kind of guy who has a speaker on the bag, couple of beers on the turn, and when most people say ‘unlucky’ when you hit it Out of Bounds my most common response will be ‘well that was a poor shot!’ I believe it’s important to have fun on the golf course. I’m lucky enough not to have to pay my mortgage with my match or tournament winnings. I pay to play, so what’s the point of playing if I wasn’t having fun? As long as I’m not affecting others having fun – I’m happy, too. WWG: So how often do you get to play? @Putting Pirate: “I’m lucky enough to be able to take most of my meetings to a golf course. Last year I clocked more than 300 rounds. 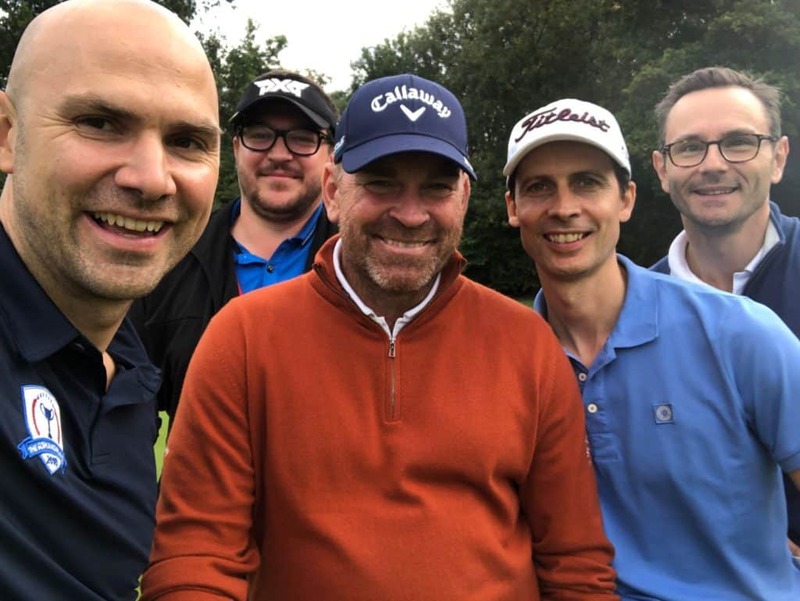 I like a challenge, so when I’ve played 240 times in a year, the first thing that pops into my head is ‘so can we break 300…’ I also have an amazing network of supportive golfers around me who are always happy to play or go away for a weekend and put a few more rounds in. Myself and Matt Jordan, who is my most regular playing partner, decided last year that we would do 30 courses in 30 days. The most gruelling part was the travel. It took away some of the pleasure of playing and it started to feel like an arduous job of work. I have no idea how much harder it must be for the pros on Tour. I don’t think a mere mortal could do it, so for this year we’ve planned the logistics of our next challenge a bit better. WWG: It’s said that you are an avid golf gear hoarder – especially PXG. Give us some idea of how much you spend on kit in the course of the year? at a fitting studio. I fell in love with them and bought them on the spot. The journey of research had begun. My next set was Mizuno because I wanted to see if it’s true that they’re one of the best ‘feeling’ clubs available. I ended up going through three sets of irons in around six weeks. Then someone on the course said, ‘Hey, why don’t you try PXG?’ just as they were getting coverage in all the golf magazines with Bob’s outrageous claims about the sweet spot being the size of Texas. 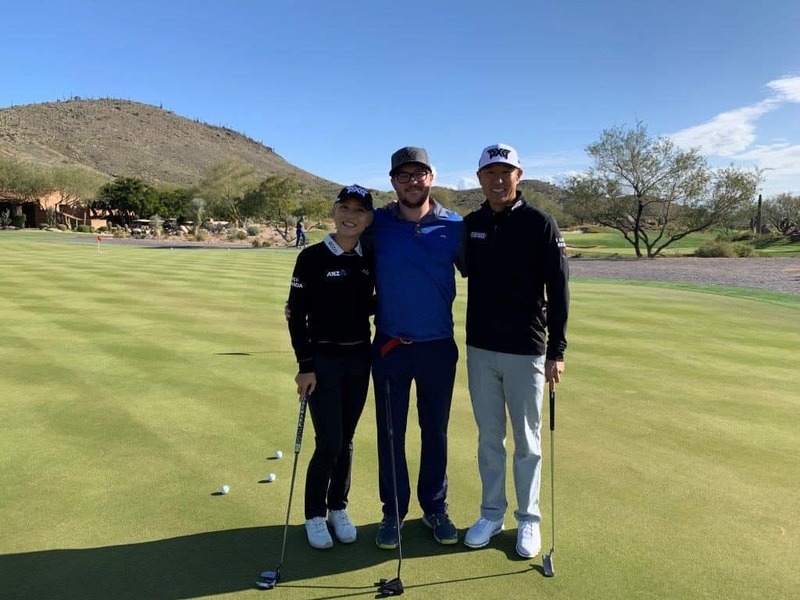 Lydia Ko and James Hahn pictured with the Putting Pirate at PXG’s GEN2 Driver launch at Scottsdale National. is PXG with the occasional appearance of a Bloodline putter when I need to focus and score low on tricky greens. WWG: What do you think about the state of golf at the moment, in regards to both the amateur and professional game? @Putting Pirate: That’s a tricky one. With all the rule changes, especially data which supports leaving the flag in, I think we will see lower scores and records being broken. I can’t say whether they will be as valid as the old ones when they had to take the flag out, or before you couldn’t repair the spike marks on the green. Then you have the Phil vs Tiger pay-per-view bonanza which I wasn’t a fan of. Don’t get me started on the rumours of the US PGA Tour taking over the European Tour. I’m not convinced that stuff like that will bring new players into the game. Any effort of growing the game is good for me. On the amateur side, I think things are in a bad spot. I believe amateurs should be able to compete in tournaments with prize money, and be sponsored by companies. Lucy Li being investigated by the USGA for her involvement in the Apple commercial which means she could lose her amateur status is a joke. There are Instagrammers and even celebrities who are ‘sponsored’ by golf companies all over the world. They’re playing in Pro-Ams, doing giveaways and growing the game. Give me a break. The game evolves and the ruling bodies should evolve, too. WWG: Due to your social media following you are hot property and have played numerous Pro-Ams but which was the most memorable and why? To make matters worse a full PXG bag is always a conversation starter with people! I overheard someone say: ‘I hope he’s not all the gear with no idea’ but I was confident and felt good after the range session. It was at Walton Heath in Surrey and I know the course pretty well. The first hole is a manageable par 4 and by hitting it too long you can leave yourself with your second shot on a massive downslope – my worst nightmare. My name got called out, I took an iron out and shanked it. Thankfully, the pro I was paired up with –Stephen Gallacher – was awesome and very encouraging. Having my coach there helped a lot, too, and my round got better very quickly. WWG: When it comes to equipment are you into the bling factor more than performance and what do you look for when changing clubs? @Putting Pirate: No – I’m not into bling at all – I’ll play anything that will help me score lower. But I am a tinkerer. I try everything. Most recently I’ve tried out a Clear Sports ball. 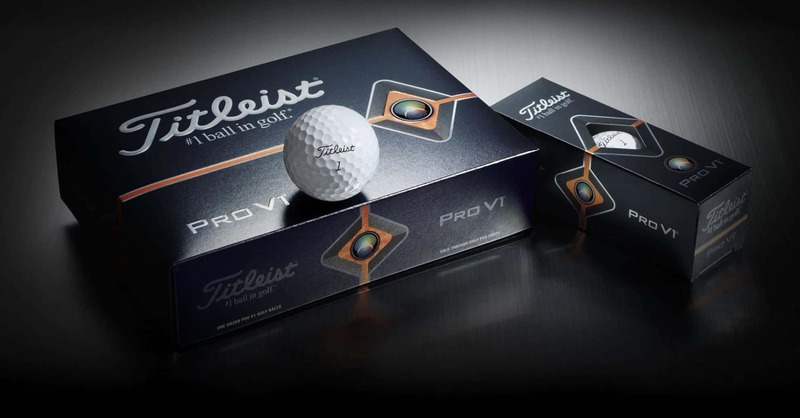 It’s the world’s most exclusive and expensive golf ball at $10 a pop. Because all golfers will claim that if you score badly it must be the equipment, right? I’m a huge believer in technology, sometimes, sadly, to a fault. 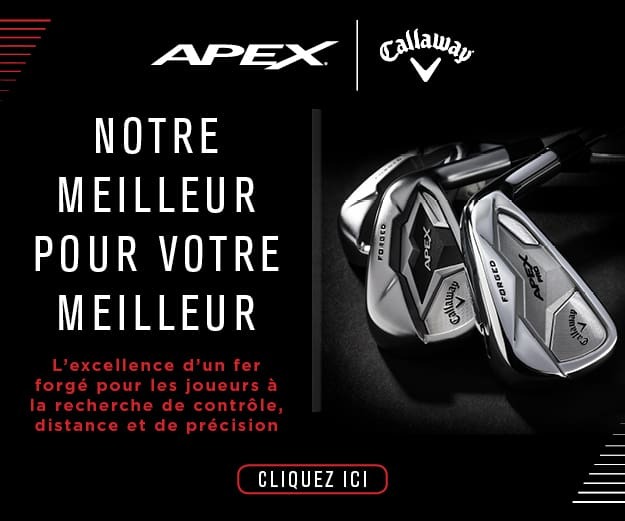 That’s why I get on so well with PXGs as they’re packed full of it. I also track every stat on every round on every shot with ‘Arccos’ and now I’m on a mission of finding the perfect composite iron shaft. The technology is the first thing I look at. What manufacturing process they use, what materials, what resin etc. For most people, that research seems boring, but if I can find superior performance, that’s all I care about. need to either have amazing trust in the brand or a lot of disposable income to just buy it online with a click. It’s been out for a while now, and I’m yet to see it in a pro- shop. Much of the stuff in pro-shops can be up to two years old yet selling at full price! There are brands like Bionic, made for people who struggle with joint pains, or Hirzl, that, in my opinion, makes the best dry/wet weather hybrid glove out there. There are trolleys like Jucad, little known in the UK and yet you see them EVERYWHERE in Continental Europe. Technology gets me excited and the technology advancements in golf is what I’m trying to expose my audience to via Instagram and on online forums. I’m also pleased when people tell me what they want me to buy and test! WWG: You have travelled the world playing some of the most bespoke courses and lived in the UAE for a while but do you think Dubai or Abu Dhabi is missing a private members-only club? @Putting Pirate: I do. I’ve been privileged to play some of the best venues in the world, most of which are private. But it’s a double-edged sword. Apart from the course condition, it’s the members who make or break your experience. For example, Royal County Down was named the world’s best course in 2016 and playing there is a bucket-list experience. But when you’re there the members are also awesome. Warm and welcoming during and after the rounds. I recall sending a ball onto a different fairway into a group of members, landing some 15 feet from them. When I saw them later I obviously apologised profusely. They just laughed it off saying it was miles away. It wasn’t, but it was nice that they didn’t try to make me more stressed than I already was after hitting such a bad shot. At a members’ course I play around London a group was jumping on us because the rule on the day was different than usual. We were unaware that you had to sign up for a tee time after coming in, unlike the usual first on the tee, first to tee off. The first question we got was: ‘Are you members here?’ Not a nice manner. So we ended up waiting for an hour to tee off even although there were slots between groups going out. In the UAE I’ve played at some great courses, and people always seem nice. Maybe it’s all down to the not-a-member mentality? The green fee cost is not prohibitive compared to similar quality courses around the world. 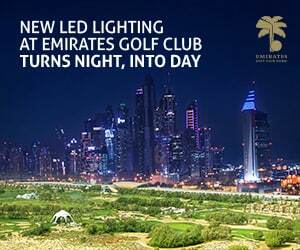 For example, I wouldn’t be able to play night golf at Emirates GC because it’s a members only thing – I’d be pretty upset. 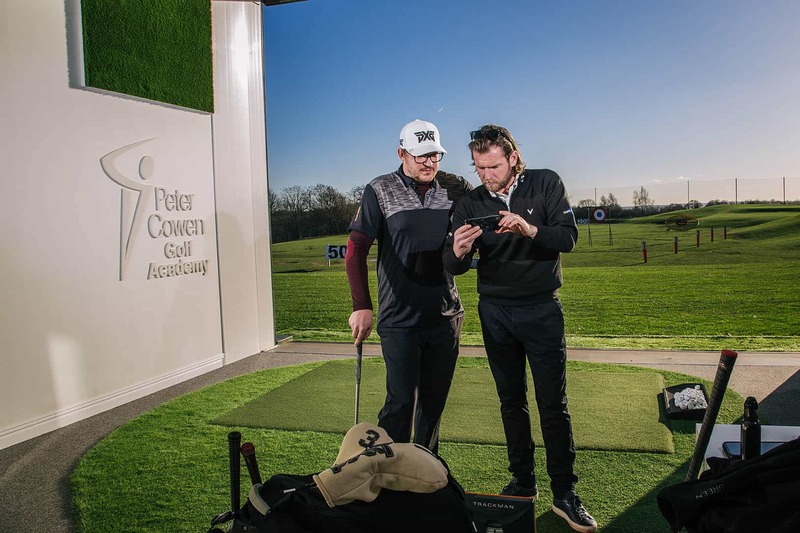 Nick Huby, Head Instructor at the Pete Cowen Academy, tries to explain to the Putting Pirate that he’s taking the club on the inside and manipulating the club head through impact. Hopefully this caption will remind the Putting Pirate why the ball goes left! Great 2 days in the freezing north! Thanks @wwgolfmag and @peter.cowen for having me! Amazing time and lessons. Shall be back soon. Driver tests coming out soon! WWG: Is 18 hole professional golf interesting or would you change things in any way to make the game more appealing? something with GolfSixes. It’s faster, it’s a team format and the country versus country aspect encourages people to root for someone. Events like Phil vs Tiger, as I said before, I didn’t enjoy. Maybe I have a bigger issue with those two players competing against one another, rather than the format itself. I had the pleasure of spending some time with Suzy Whaley, the first female President of the PGA of America, and we spoke about making golf more appealing. It’s definitely on everyone’s mind, and there isn’t just one solution. I’m sure we will see some new formats in the next few years. Maybe more pros will have microphones so that the viewers can become bigger part of the Tour experience? WWG: Rumour has it you shot a 67 the other day. Not bad for a chopper! Have you set yourself any targets and how are you going about achieving them? @Putting Pirate: Oh yeah. I’ve been chasing that under-par round for quite a while! I’ve come close a few times, like standing on the 16th par-3 being 3-under and hitting the first ball Out of Bounds! And then doing the same with a provisional… It’s soul crushing but you just have to take your medicine and carry on. It’s like landing on a green and seeing your ball in the spot where the cup was just a few days ago! Keep calm and carry on! The course I played is short and forgiving 5,800 yards par 70 so even a not-so good tee shot still won’t kill your score. I really want to repeat it and shoot 67 at something closer to 7,000 yards. The day after I shot 67 I shot a 91. Granted, the celebrations that took place the night before may have had something to do with it. I’d also like to be involved even more in growing the game. I’m toying with the idea of sponsoring some juniors, or maybe organising some events. But if I have as much fun on the course next season as I’ve had in the last – I’ll be content.